We just completed a wonderful six week class series, Conscious Relationship, The Heart of Yoga. Yoga is the practice of being fully present with what is and bringing forth the wholeness, union and LOVE that is our true nature. While we may do our yoga postures “on the mat”, one of the greatest opportunities to live these practices is in our relationships. Each week we focused on a specific practice that helps us skillfully, mindfully and heart-fully relate to our selves, our divine source and our loved ones. Our grand finale on week six was an opportunity to make the quantum shift into the acknowledgement of ourselves as Emissaries of Love in the world. We honored each other, and then turned all our combined light and love towards our partners, families, communities, colleagues and the whole world. So, So inspiring. This truly is my great passion and life long intention. To share the skills, practices and energy of conscious living and relating with my global family. Please join us for the next offering and let me know if you would like me to come to your area to offer a retreat, workshop or class. May all hearts be healed, may all beings know the blessing of loving and being loved! 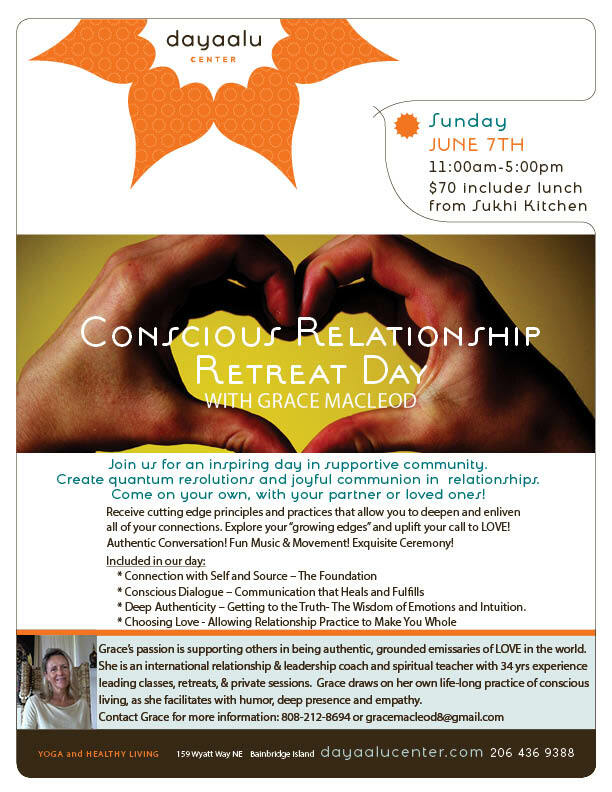 SOUL RENEWAL RETREATS ON BEAUTIFUL BAINBRIDGE ISLAND AND BEYOND!